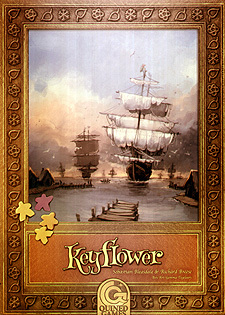 In Keyflower, each player starts with a 'home' tile and an initial random team of workers. Matching coloured workers are used to bid for tiles to add to a player's village, to upgrade tiles or to generate resources, skills and additional workers. Players not only use their own tiles, but can also use tiles from the other players' villages, or even the new tiles being auctioned. During the first three game rounds; spring, summer and autumn, more workers will arrive aboard the Keyflower and her sister boats, some skilled in the working of the key resources. In winter, the final round, players will choose the village tiles for auction, each offering victory points for certain combinations of resources, skills and workers. The player whose village and workers - generate the most victory points wins the game. I am really enjoying playing this and have racked up 3 plays so far and will always be willing to get in on a game. Its a lot of fun with plenty to think about as you plan on bidding for tiles or using tiles for their ability etc. Planning your village to aid your scoring or tempting players to use areas thereby giving you meeples to use later takes some thought. There is a lot of game here and plenty of strategy and with a random layout each time the game is different every play. Great design and immense fun to play. Keyflower is the latest in the Key series. Without that knowledge the title may at first lead you astray, as it did my wife, who wondered at my purchase of a seemingly gentle game! Superficially, this is the world of the Mayflower and early colonist expansion in the New World, but if you are looking for depth and appropriateness of actions to this theme, then you may be disappointed. However, if you are looking for a fascinating and enjoyable experience that takes many established game features and blends them in unexpectedly new ways, then read on. The physical quality is very good, particularly the large hex tiles that you will attempt to gain at auction to form your playing territory. Lashings of wooden meeples, wooden resources, cardboard resources and highly detailed full colour player screens. Only the latter may draw some criticisms, as they are the most flimsy item in the package and do take up a fair amount of space in the box once assembled. First of all this is a relatively short game with only four turns: Spring Summer, Autumn and Winter. At its heart you are bidding for a number of tiles each season that will allow you do perform a number of actions. Each player starts with a random mix of the main three colours of meeples and these meeples are used for everything. To buy the tiles - you need meeples. To use the tiles - you need meeples. In some cases, the action on the tiles even needs meeples! And like every good game you never have enough. What makes this auction original is that all the available tiles are there throughout the turn to be used even before any player has gained final possession of them. Throughout the turn you can add to the number of meeples you are bidding for on a tile, you can remove the number of meeples on a bid and use them for a bid elsewhere or to activate a tile. What then shapes your game plan? Well, at the very beginning of the game, each player is given an equal number of scoring tiles that may be used in the final turn : Winter. The KEY word is MAY be used, because at the beginning of Winter, each player has to decide which of his/her scoring tiles to put up for auction. So, you had better have enough meeples at the end to use for bidding or you may just see the scoring tile you need snatched away by a higher bidder!